The CHL held its annual import draft today, where teams from across the Canadian junior leagues get to select the rights of players around the world. Often these are recently drafted prospects, or those seen to have good chances at next year’s draft. Being selected has no guarantee that the player will actually ever suit up for the team, as Filip Chytil proved last season. Chytil was selected seventh-overall by the North Bay Battalion, but ended up spending the year with the New York Rangers and Hartford Wolf Pack after impressing in his first training camp. There are clear benefits from picking at the top of the draft though, as the Barrie Colts found out last season. Andrei Svechnikov was the first-overall selection, and ended up scoring 40 goals in 44 games before being the second-overall pick in the NHL draft last week. This year saw Slovakian-born Maxim Cajkovic go first to the Saint John Sea Dogs after tearing up the Swedish junior leagues last season. Cajkovic is eligible for the 2019 NHL Entry Draft. Teams are only allowed a certain number of import players, which leads to some passing on their selections even in the early part of the draft. Check out last year’s draft to see some familiar names. With a full-slate of 15 games today on the final weekend of the regular season, most teams will wrap up their regular season today and the playoff order should be more clarified by the end of the night. Most prominent will be which team clinches the final playoff spots. A Philadelphia point will give them the Eastern Conference’s final spot over the Florida Panthers, while the Colorado Avalanche and the St. Louis Blues will play for the right for the final spot in the West. Colorado needs a regulation victory tonight to vault themselves into the playoffs. In the meantime, several teams are making minor changes for the final weekend of the regular season. The Arizona Coyotes announced they have recalled defenseman Joel Hanley on an emergency basis. The 26-year-old has played four games with the Coyotes this year, having spent most of his season with the Tucson Roadrunners of the AHL, putting up two goals and 17 assists in 50 games. ArizonaSports Craig Morgan adds the move was made as defenseman Kevin Connaugton is a little banged up. The Ottawa Senators announced they have recalled defenseman Andreas Englund from the Belleville Senators of the AHL and is expected to play today as Ben Harpur is injured. Englund was recalled back in December, but didn’t play in a game. The 22-year-old former second-round pick had one goal and nine assists in 66 games for Belleville. The New Jersey Devils announced they have recalled defenseman Steven Santini and goaltender Eddie Lack. Both were recalled as the Devils are expected to rest numerous players today, including Taylor Hall, Kyle Palmieri, Travis Zajac and Sami Vatanen. With Cory Schneider getting the call to start in goal today, it’s likely the team also intends to rest starter Keith Kinkaid. The 23-year-old Santini has played in 36 games for New Jersey and 27 for Binghampton. Lack will likely serve as backup tonight. He has appeared in eight games this year, four with New Jersey. 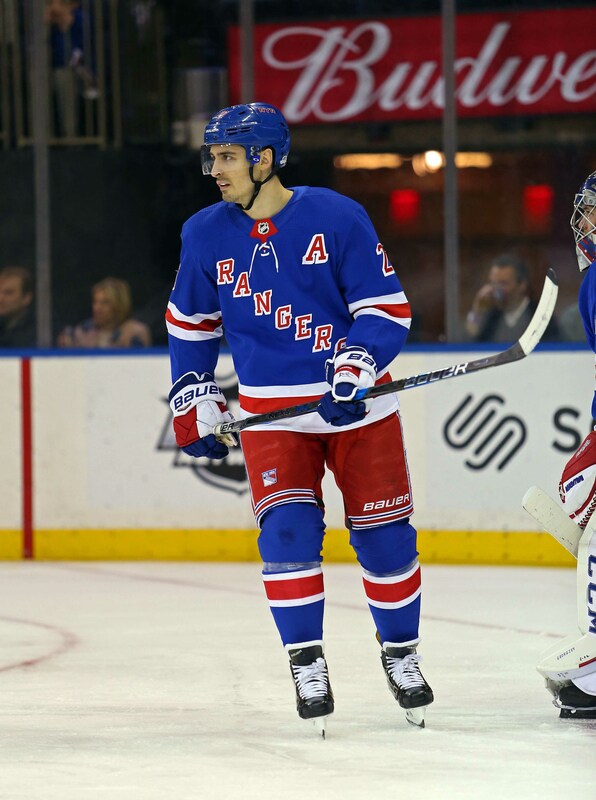 With the New York Rangers’ season over after Saturday’s 5-0 loss to the Philadelphia Flyers, the Rangers announced they have assigned forwards Filip Chytil, Lias Andersson and Steven Fogarty to the Hartford Wolf Pack of the AHL for their upcoming playoff run. Chytil and Andersson were both recalled on Mar. 26 with Chytil picking up a goal and two assists in six games. Andersson had a goal and an assist in those six games. Fogarty was recalled last night and didn’t get into a game. Although negotiations can’t begin until July 1st, Senators center Matt Duchene acknowledged to Postmedia’s Bruce Garrioch that he is open to discussing a long-term contract extension to remain with the team. Ottawa picked up Duchene in an early-season trade with Colorado and while he struggled early on, he has picked up his play in recent weeks, recording 25 points in 26 games since February 1st. The 27-year-old carries a $6MM cap hit through 2018-19 while his salary increases to $6.5MM for next season as well. It’s likely that he will be looking for a similar, if not bigger, deal in order to put pen to paper on an early extension with the Senators and forego his first foray into unrestricted free agency. Hurricanes head coach Bill Peters has an opt-out in his contract that will permit him to see what other opportunities might be out there, reports Sportsnet’s Elliotte Friedman (video link). This is his fourth season with Carolina and unless they pull off a stunning run and get some luck along the way over the next two weeks, he will have missed the postseason in each of those years. Peters has one year remaining on his contract. Still with Carolina, the Hurricanes announced that they have recalled winger Warren Foegele from Charlotte of the AHL. The 21-year-old is in his first professional season and sits tied for seventh in the AHL in goals with 26 in 65 games with the Checkers. This is his first recall to Carolina. The Rangers have promoted their top two center prospects, announcing that they’ve recalled Lias Andersson and Filip Chytil from Hartford of the AHL. The two players were New York’s first-round picks back at the 2017 NHL Entry Draft. The timing is particularly noteworthy – the Rangers have seven games left which means neither player will reach the ten game mark to burn the first year of their entry-level deals; while this will be Andersson’s first taste of the NHL, Chytil played in two games at the beginning of the season.